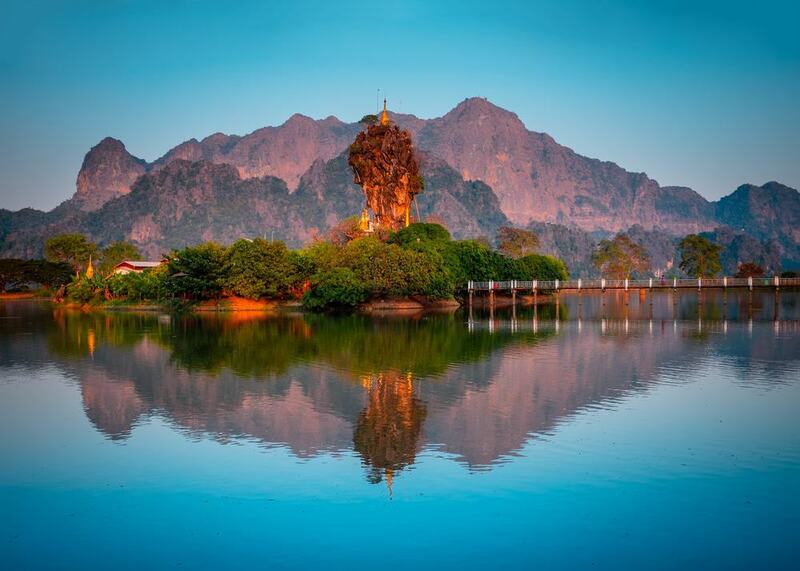 Hpa-an is a small town that lies in pretty Kayin State in the southeast of Myanmar. The main reason why Hpa-an is famous is down to its idyllic scenery which is said to be some of the prettiest in the whole country. Hpa-an is also known for its amazing cave systems, so if you like spelunking then this is definitely the place to come. 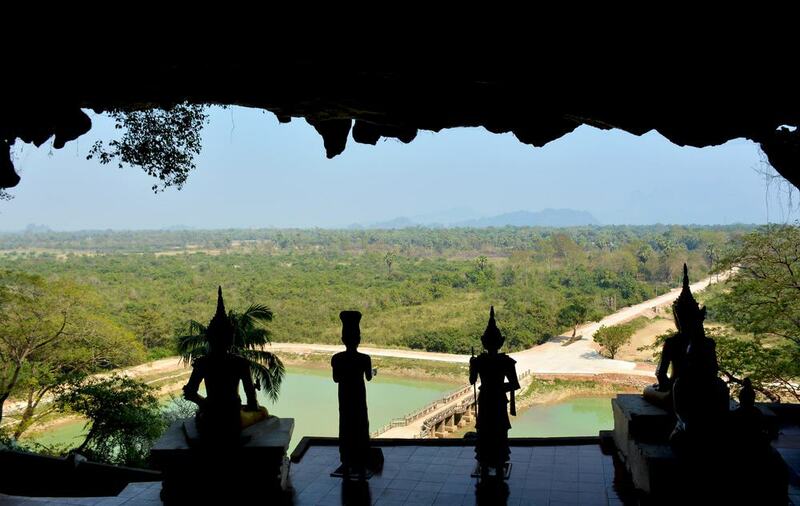 Some of the caves are historical relics which are filled with incredible statues, and you can clamber through some of them and admire the art work inside and the natural attractions like crystals and stalactites. 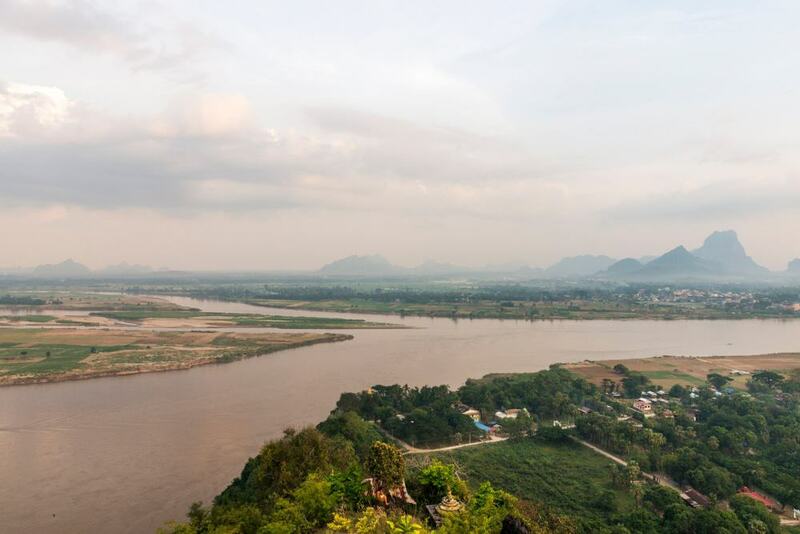 As well as the cave systems, you can also enjoy the scenic river here and spend time cycling through the emerald-green countryside that surrounds Hpa-an. Kyauk Kalap is located in the middle of a pretty artificial lake and basically consists of a large piece of dramatic rock, atop which is a scenic pagoda. Once you scale the rock you will be treated to amazing views of the surrounding scenery and you can even look across to dominating Mount Zwegabin. If possible, try to come here at sunset when the views are absolutely spectacular. There is also a monastery which used to be the home of a famous monk called U Winaya. If you want to start the day as the locals do, then head to a traditional teashop in Hpa-an such as White which is one of the most famous teahouses in town. 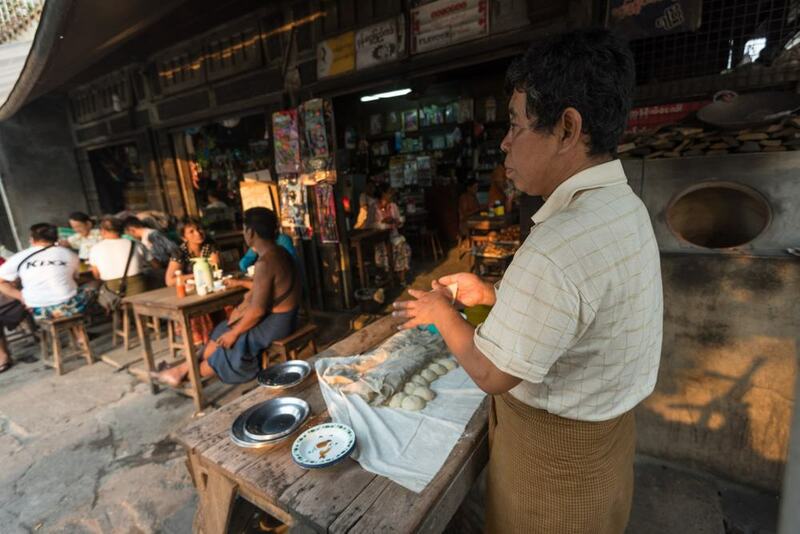 Here you will find the signature breakfast in this part of Myanmar which consists of delicious fluffy flatbreads which are served with a side of the local coffee. This is a particularly good choice if you want to go out into the surrounding areas to go spelunking as you can order some of the flatbreads to take away and keep you going throughout the day. 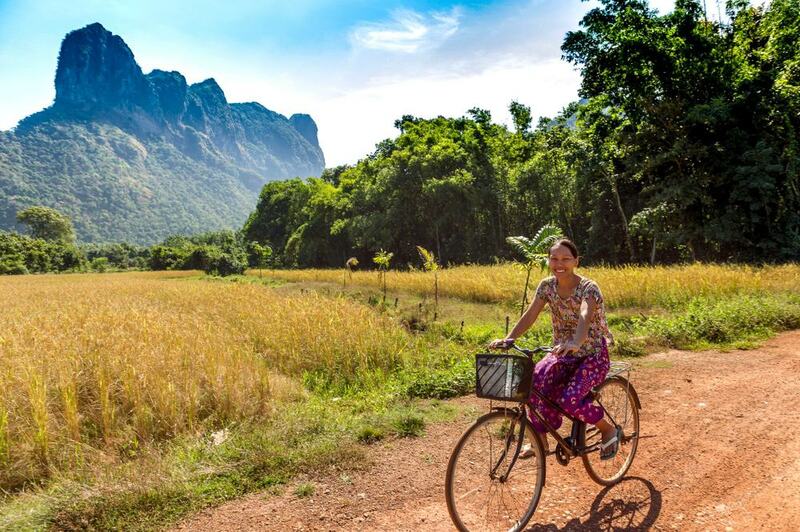 One of the best ways to get around in Hpa-an is to sign up for a bike tour which will take you around all the local sights. 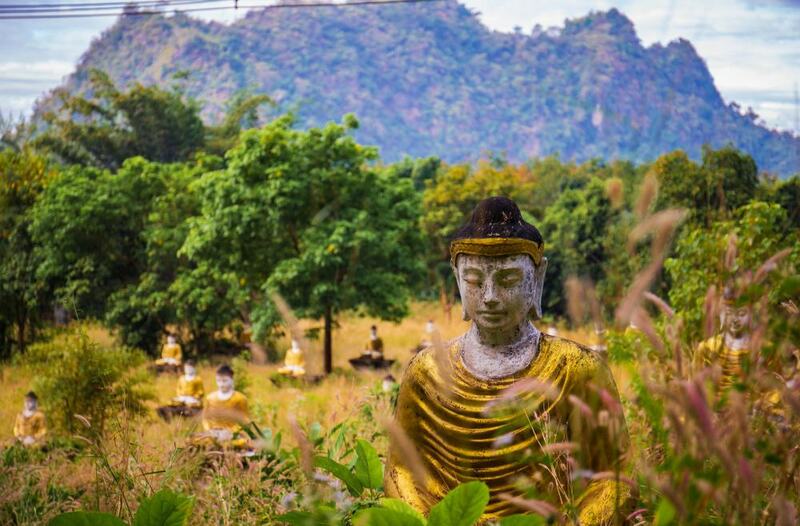 This is a relatively new addition to the sightseeing scene in Hpa-an but you can join half day or full day tours and if you are in a hurry then this can be one of the best ways to take in the surrounding area. As much of the terrain here is flat, traveling by bike is one of the nicest ways to take in the natural splendor of this part of Myanmar. Kawgun Cave is famous as it is filled with works of art that are said to date from the 7th century. It is also known for being built by King Manuaha who lost a famous battle in Myanmar and then took refuge in the cave, decorating it lavishly as he did so. The cave is covered in thousands of small images of the Buddha which are made of clay, and there are also carvings etched into the walls of the chamber. Take care if you come here during the rainy season which last from June to October in Myanmar as you may not be able to access the cave if there is a risk of landslides. Yathaypyan Cave is around a mile away from Kawgun Cave and is widely said to be the less impressive of the two, although it is still worth a look if you are in the area. The cave had a central chamber with some pretty pagodas in it as well as a number of notable wall carvings made from clay. As with Kawgun Cave, it is also often closed from June to October if the area experiences heavy rains. Unlike Kawgun Cave, you can walk across Yathaypyan Cave which takes around 10 minutes from one side to the other. When you emerge from the cave you will find yourself at a natural viewpoint that lets you look over the valley below. Located close to Kawgun Cave is Lakkana Village which is a tradition Kayin village that is nestled close to Mount Zwegabin. The village has made a name for itself as it has been the location of a number of films about Myanmar and it is easy to see why when you visit. The scenery in this part of the country is some of the most beautiful in Myanmar and you can spend an afternoon walking around and bathing in the numerous swimming holes that dot the area. The local clothing of choice in Myanmar is the longyi which is basically a piece of fabric which is worn around the waist similar to a sarong. Traditional longyi however usually do not come with zippers or ties, so if you want to make sure that your garment doesn’t fall off at an inopportune moment then you may want to have it customized at a local tailor. Many of these are located around the local clock tower and you can also have other items made here extremely cheaply. Hpa-an is known for its cave, but probably the most spectacular is Saddan Cave. The entrance is covered in statues of the Buddha and there are also a number of pagodas inside as well as clay wall carvings. You can walk through the different chambers of the cave which takes around 15 minutes, and if you are not afraid of the dark then it is well worth it as you will pass amazing stalactites and walls that are made up of natural crystals. 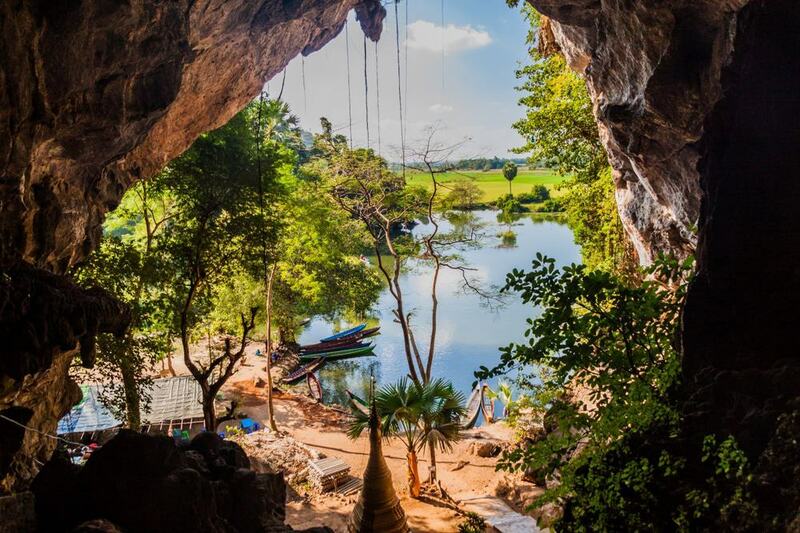 Once you trek across the cave you can leave it through a hole on the other side which overlooks lakes and mountains. If you want to relax but also want to support the local community then head to Kan Nar Street in Hpa-an which is known for its blind masseurs. All the money from the massage is funneled back into the local community in order to train blind masseurs who would struggle to find other work in Hpa-an. You can choose from a range of traditional massage options, some of which last up to two hours. If you fancy getting out of Hpa-an for the day then consider taking a trip across the river to neighboring Hpa-pu. The trip across the waterway takes around 10 minutes and Hpa-pu is a scenic village which makes a nice change of pace to Hpa-an. From the village you can easily walk to the top of the large hill here where you can then look out across the countryside and get scenic views over Hpa-an. 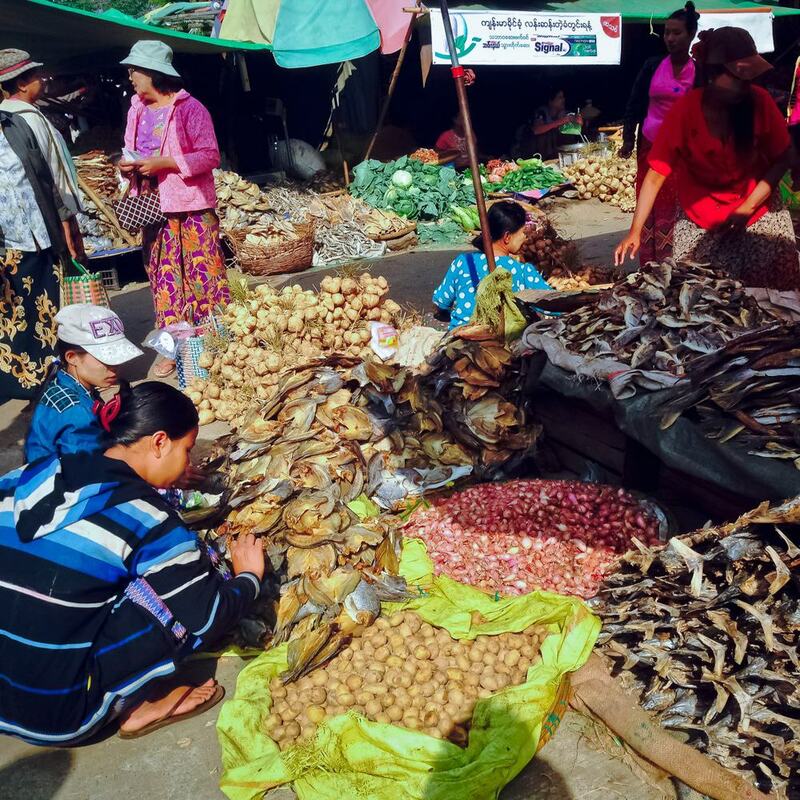 The traditional market in Hpa-an is located across from the main mosque in town (sometimes known as the Red Mosque) and is a good place to come for breakfast. You will find a number of produce stalls here which are piled high with delicious local fruits and vegetables, and you will also find a number of vendors serving flatbreads and coffee. 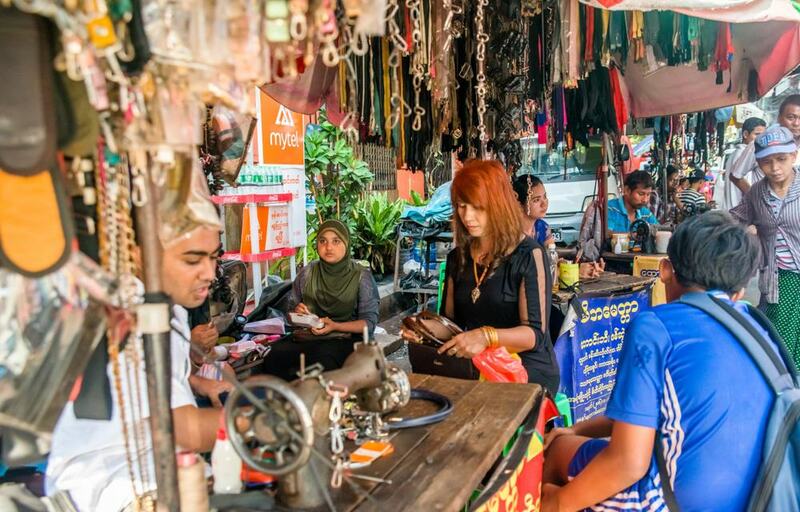 You can also buy other items in the covered part of the market such as textiles, gems and gold. If you want to travel on from Hpa-an then consider taking the boat to Mawlamyine which is a three hour journey up the mighty Than Lwin River. There are a number of different boats you can take including a river cruise which is more expensive than the local ferry but offers you a far more comfortable trip. 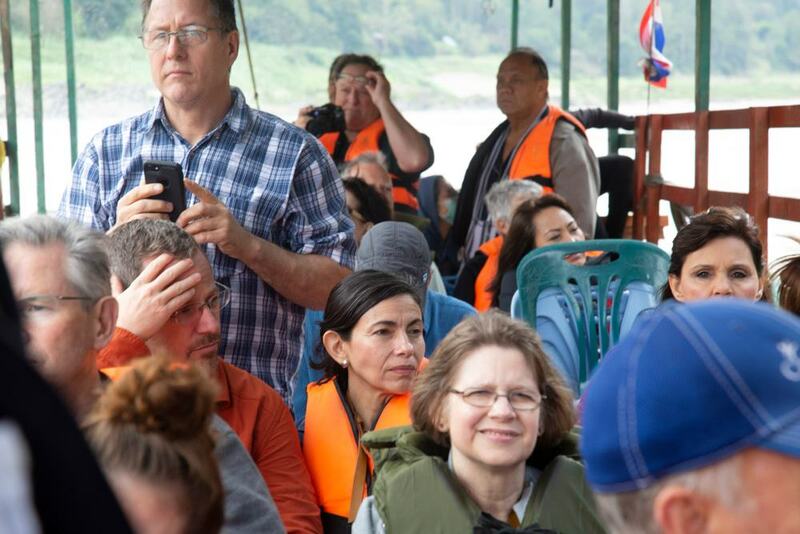 If you are in a hurry then you can also take a speedboat and sometimes the local ferries don’t run, such as in the rainy season, so make sure to check the options in advance. Bat Cave is yet another of Hpa-an’s famous caves although you can’t actually go inside this one. The main reason to come here is to check out the thousands of bats that fly out of the cave in the evening to feed. They then fly back again in the morning and sleep off their meals for the rest of the day. 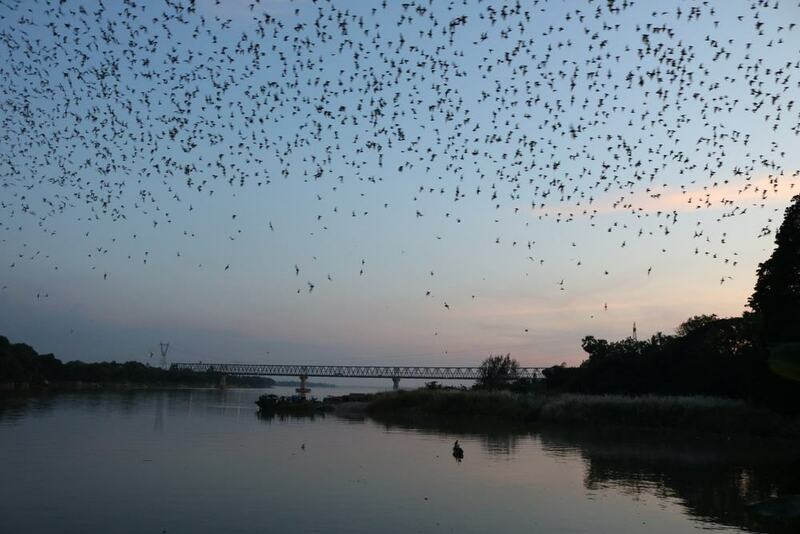 When the bats leave the cave at dusk, children at the site often beat cans to make the bats dart all over the sky in different formations and this is really quite an amazing sight if you have never seen anything like it before. 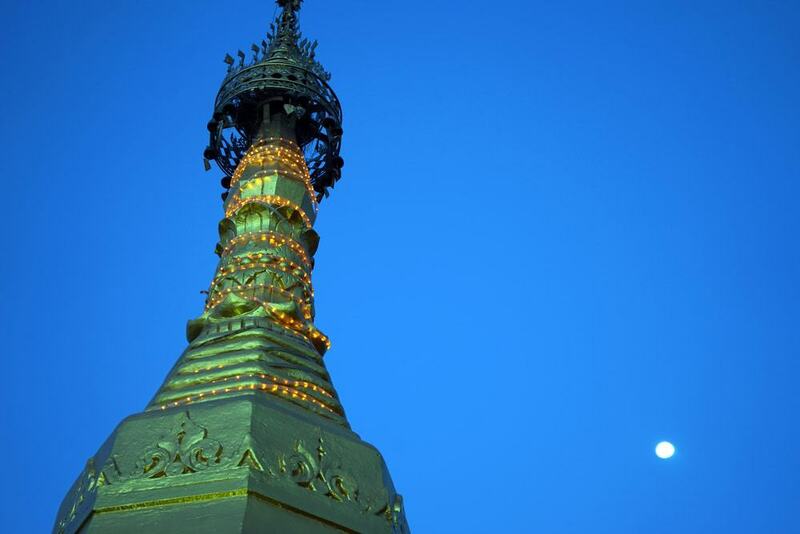 Shweyinhmyaw Paya is a delightful pagoda that is located in the north of the town. Many people come here around sunset when you can climb a viewing tower and watch the pagoda glittering in the afternoon sun. If you don’t want to climb the tower then you can also sit next to the river and take in the pretty architecture of the pagoda that way. If you are looking for a bit of an adventure in Hpa-an then consider climbing its signature peak Mount Zwegabin. The mountain dominates the skyline here and it takes around an hour to get to the top, or two hours if you take it slow. There is a monastery at the top which some people may like to stay the night in for the full local experience. Make sure to ask if this is possible ahead of time however to avoid disappointment as the monastery sometimes doesn’t accept foreigners. 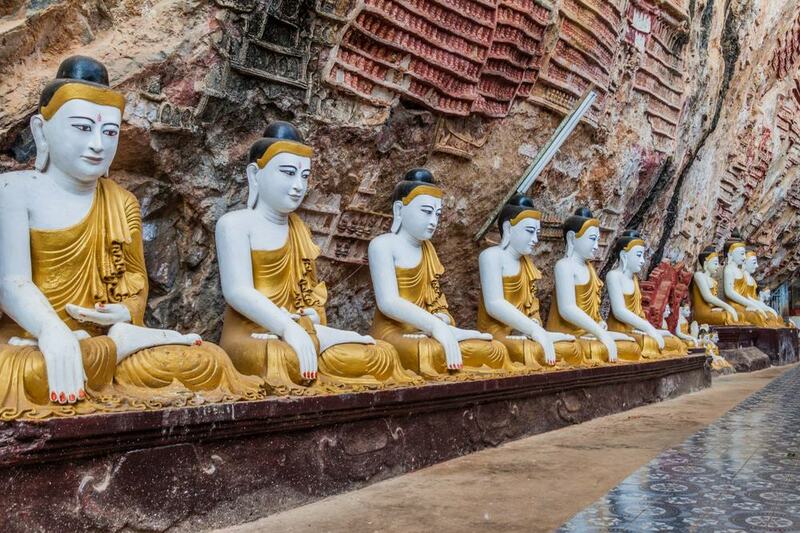 As you walk up to the monastery you will also pass a number of pretty Buddha statues along the way.